Design patterns: iterator » Hello World! Next chapter in the book is the longest one. But I will split it into two posts because it’s about two design patterns. The first one’s name is: iterator and it was mentioned at least once before. I recall it while describing examples of adapter pattern usage. The iterator pattern, unlike other design patterns, helps us encapsulate an iteration. Let’s start with the book example. Imagine there are more restaurants merged and for each of them we’ve got different menu and to display it we need to add more loops… How to avoid it? Well, as always let’s see what’s changing element here. It’s the iteration through different items. 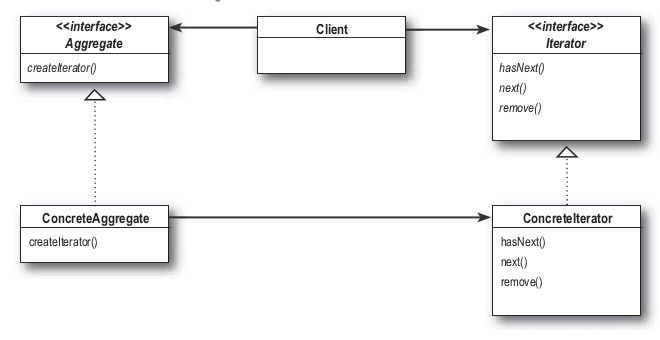 And we can encapsulate it with iterator design pattern which diagram and definition are presented below. The Iterator Pattern provides a way to access the elements of an aggregate object sequentially without exposing its underlying representation. Create iterators for our menus. Rework the menu with iterator. Fix up the waitress code. Changes in menu classes are simple: we add a getter which returns menu’s iterator and we remove getMenuItems() methods because we don’t need it anymore and what’s more important: we don’t want to expose internal implementation of a menu. Our waitress function of printing menu is handled now by two methods: first one creates menu iterators’ instances and passes them to the second method which in one loops prints items for both menus. But the work done doesn’t reflect in 100% iterator pattern diagram. That’s because the client code depends on two classes where it could refer to each menu object using an interface rather than concrete class. Let’s create a Menu interface with createIterator() method. DinnerMenuIterator and PancakeHouseMenuIterator implement the new interface and reduce the dependency between Waitress and the concrete class. Now, all the work is done and seems solid. We lost names of the menus but we could add the names to each menu. We also followed another design principle: single responsibility principle. It says that a class should have only one reason to change. If we would have left the classes responsibility of handling their aggregates and one more responsibility of iterating through aggregated elements then there would be two reasons to change. They would change if collections change and if the way we iterate through the collections changes. We know we want to avoid change in a class like the plague — modifying code provides all sorts of opportunities for problems to creep in. The above snippets are taken from full PHP example of iterator pattern usage I’ve written — feel free to take a look at it. Difference between types in Java and PHP was the hardest part to write this post’s code examples. Reading the part of the chapter about iterator design pattern was easy and with Java’s Array, ArrayList or Hashtable types it was even easier to understand how iterators help. Those built-in objects have their method’s such as iterator() which returns an iterator instances. But PHP even though it doesn’t have so many collection types it has also quite cool built-in features. The list of built-in iterators is quite impressive. And unfortunately, I barely had chance to use them. Maybe it’s becauseof the feeling Stefan Froelich mentiones in his Sitepoint article about SPL Iterators. The overwhelming feeling when you see this impressive list of SPL iterators’ classes names.